A gorgeous stateroom dressed in olive and white, influenced strongly by the baroque designs associated with the “Sun King”, Louis XIV. The intricate scrollwork takes on an almost silver hue – Louis XIV loved the precious metal so much that he often commissioned solid silver furniture (later melted to refill the treasury post-war). Thankfully, the furniture here is much more subdued. Gallery sofas – sometimes referred to as boudeuse (French for ‘sullen’) – allow visitors to appreciate the sophisticated surroundings from any angle. For a very similar contemporary version, check out the Epoch sofa by British designer Christopher Guy. Rounded furniture more accurately represents the Louis XVI period, rather than Louis XIV, yet they work wonderfully in this design. Of all the Louis-inspired furniture available today, those oval-backed chairs are probably the most beloved. The thickness and ornamentation makes them quite different from the ones you’d find at the market, however. 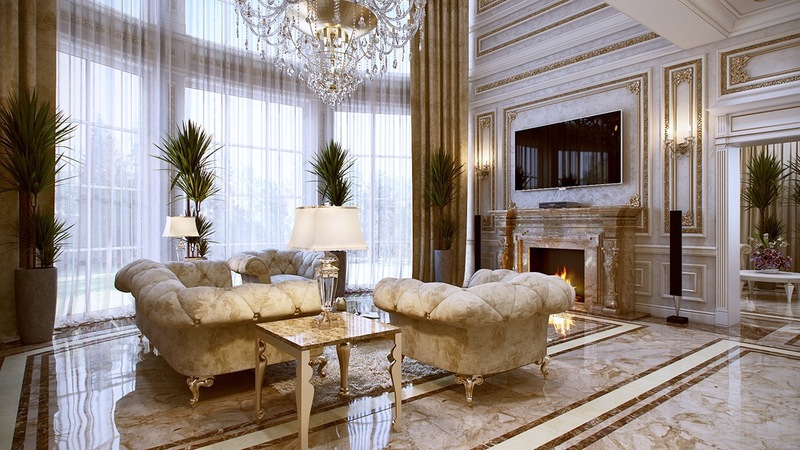 This luxurious home combines neoclassical and modern design. 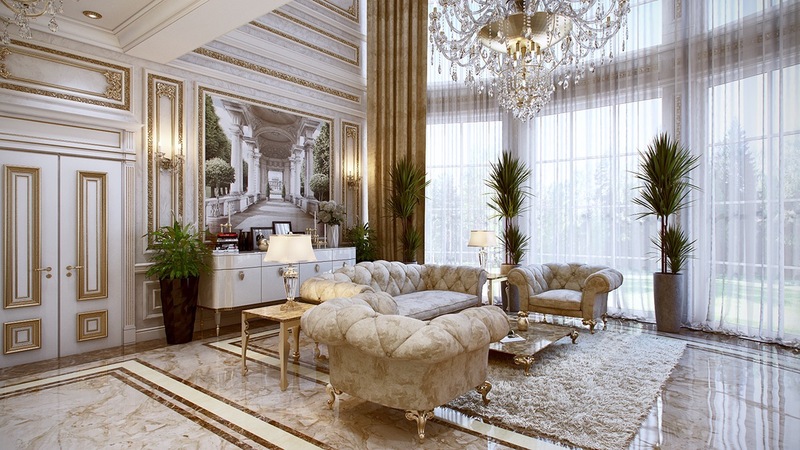 The streamlined aesthetic is reminiscent of Louis XVI – note the fluted legs on the sideboard and side tables. 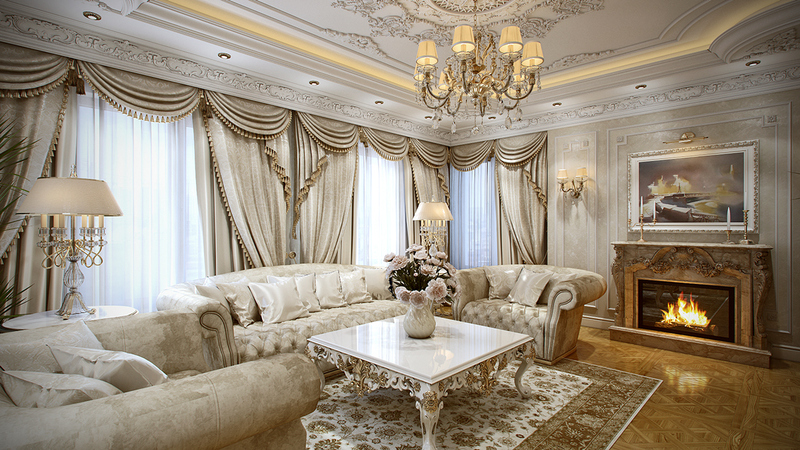 Neoclassical decor took cues from Etruscan influences, which itself is derived from Greek architecture. 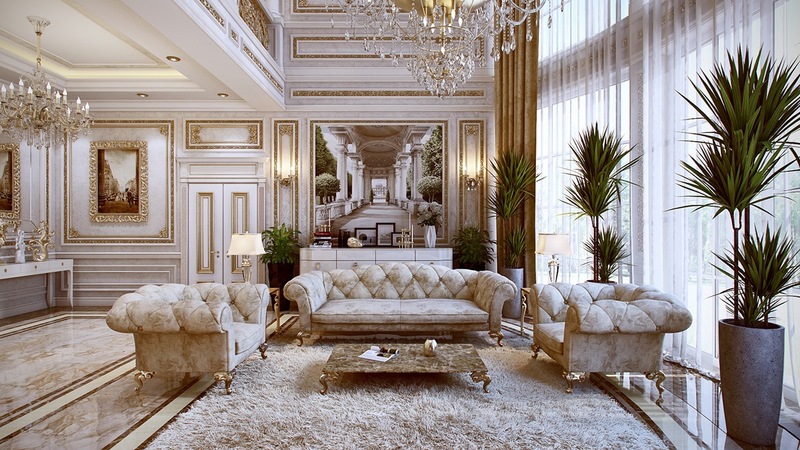 These sofas and chairs offer a luxurious take on the Chesterfield, made quite unique with oversized diamond tufting and ornate Chippendale legs. They’re perfectly coordinated with the rest of the space even if furniture like this didn’t exist until many years after the last Louis gave up the throne. Although, interestingly, Thomas Chippendale and Philip Stanhope (the Earl credited for commissioning the first Chesterfield) were both contemporaries of Louis XVI. Greenery, gilt, and heavy fabrics create a warm look despite the home’s vast proportions. 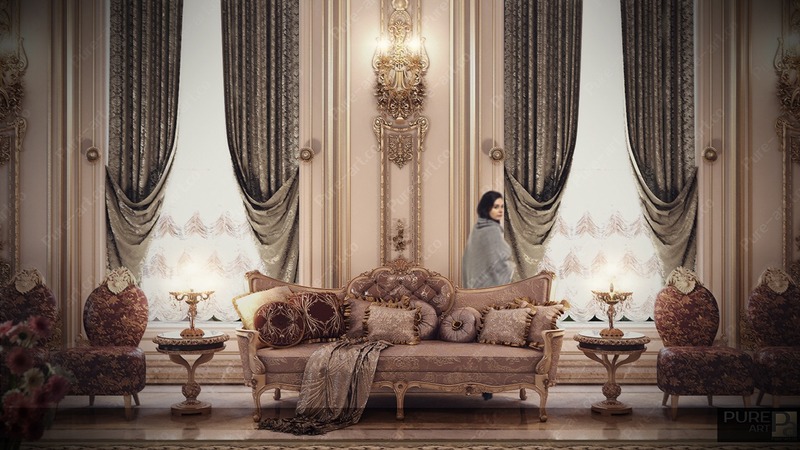 The colors are truly lovely – not as flashy as the gold typically applied in Louis-era designs, but still sophisticated enough for a palatial theme. 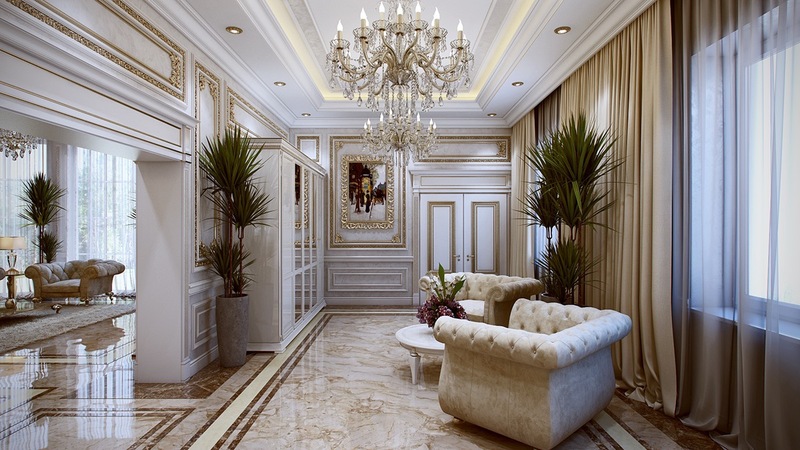 A small outer-parlor makes good use of extra space in the hallway and features a decidedly more subdued style. Simple lines and textures are well suited to this area’s purpose. 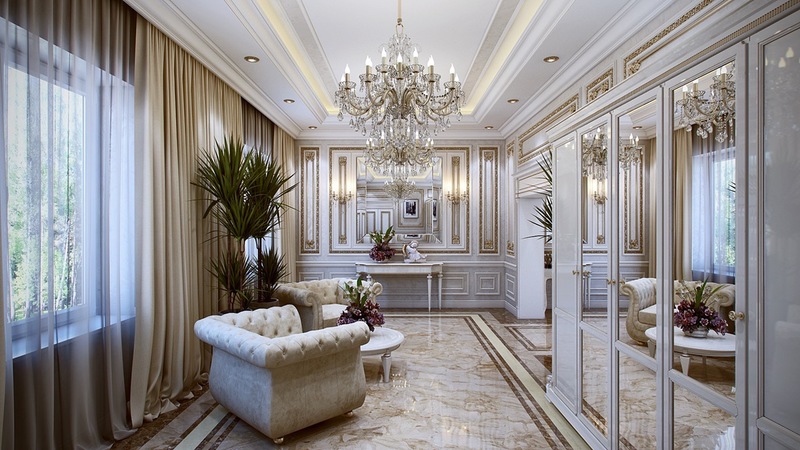 Mirrored cabinetry reflects the light and makes the hallway look even more weightless and spacious. Such a decorative chandelier won’t work in every hallway, so take note of this brilliant application – it works wonderfully here. 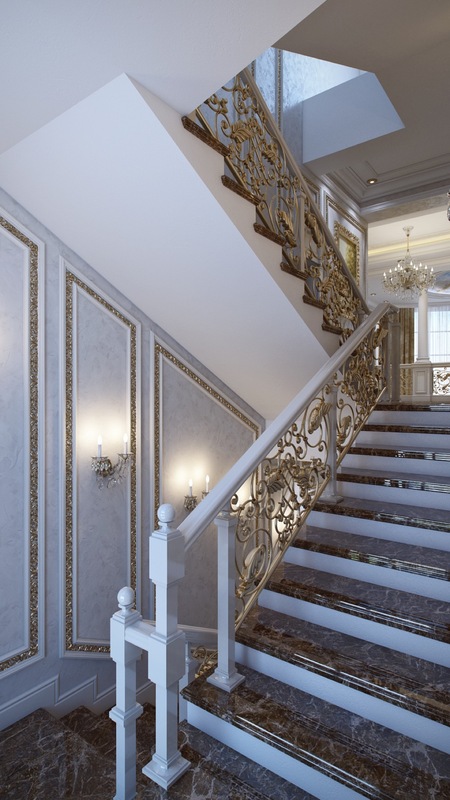 Louis XVI championed neoclassical design as a less-extravagant alternative to the excesses of rococo, but this lavish staircase provides a necessary counterbalance to the straight lines that define the rest of the interior. 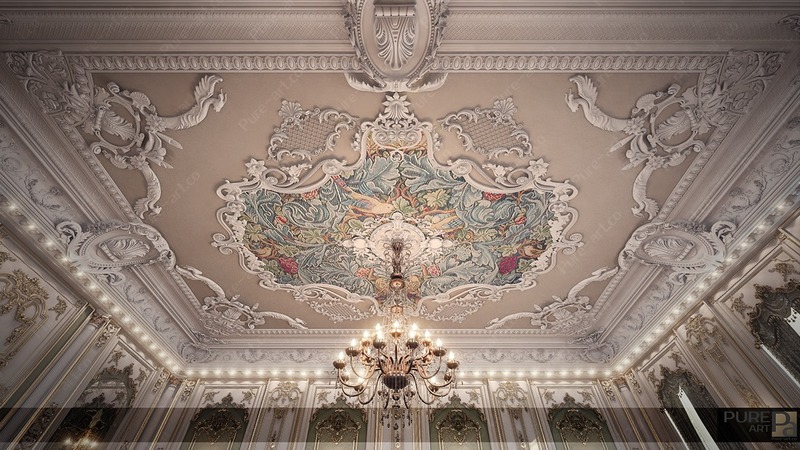 Despite its association with baroque design, the acanthus scrollwork is another feature derived from Greek architecture – so it’s still true to the neoclassical theme overall. Different from the baroque and rococo inspiration of the previous homes, this unique space seems to rely more on Provincial and Empire influences. It’s an eclectic and romantic aesthetic – appropriately titled “Coffee with Milk”..
Only the faintest hint of baroque influence touches the kitchen. 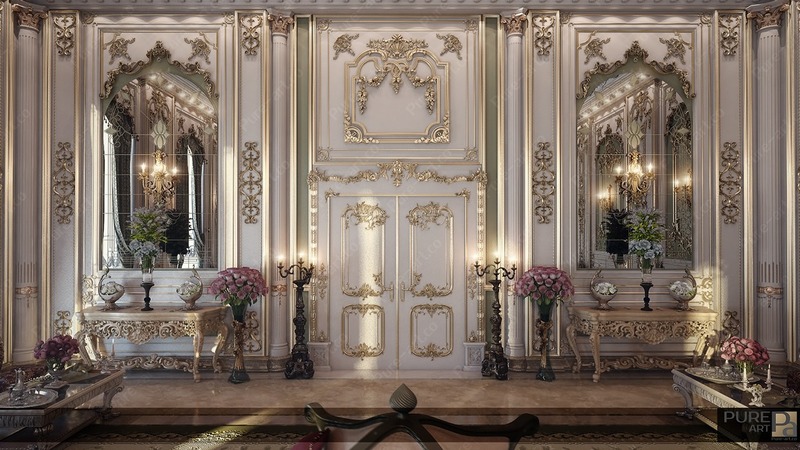 It’s elegant, low-key, and demonstrates how versatile French provincial design can be. 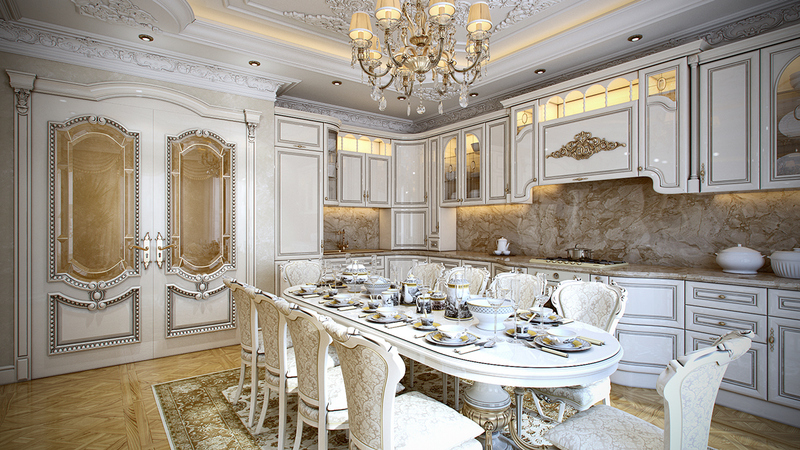 The damask dining chairs are especially admirable. 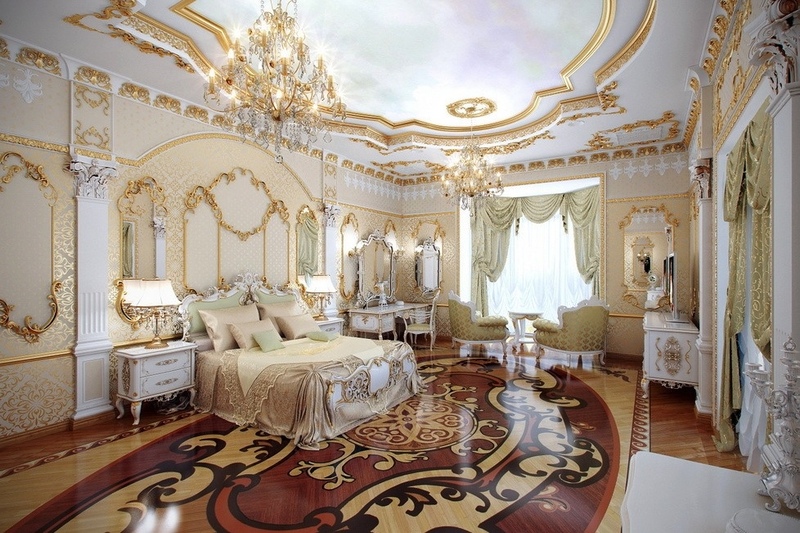 Louis XV would have approved of this design, without a doubt. 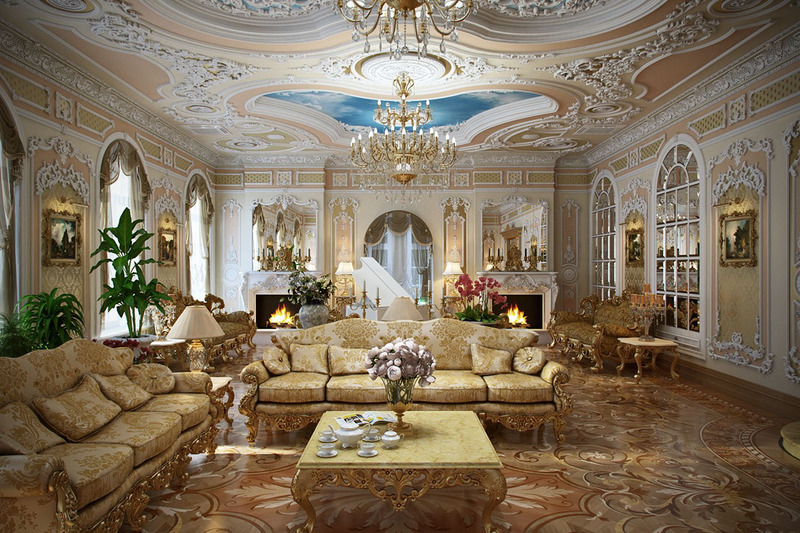 It has an undeniable rococo vibe and embraces the strong scrollwork and ornamentation of the era. Madame Pompadour – Louis XV’s famous mistress – actually had shades of blue and pink named after her, so the soft palette used here is incredibly on-trend. Absolutely gorgeous! This private room shares many similarities with the style found throughout the petit appartement du roi at Versailles, famous for demonstrating the clearest examples of Louis XV’s design influences. 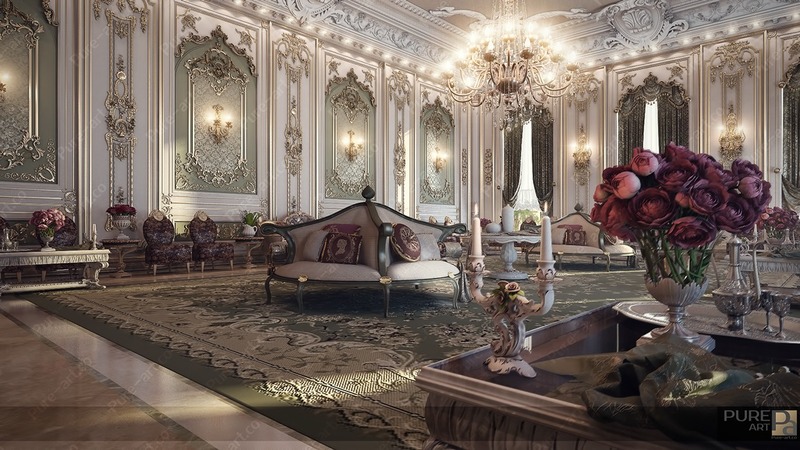 This visualization is just as opulent as the iconic Versailles rooms, yet displays its own unique character with the addition of a breathtaking inlaid floor.